The theme for September at EC Montreal is apples and wine. Planning the free monthly activities is a lot of work but something the operations team greatly enjoys. On the menu; apple martinis, all types of foods made from our wonderful Quebec apples; apple pancakes and apple pies to name a few and wine tasting!! 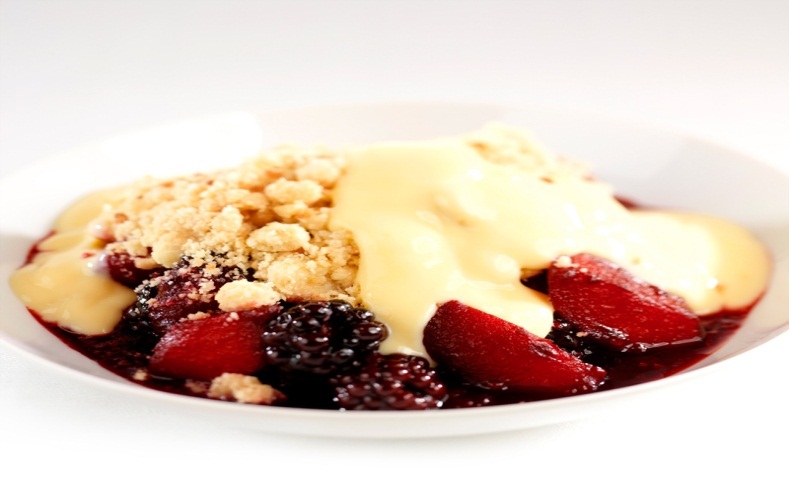 Our homestay Louise was kind to send us her recipe for apple & blackberry crumble. Looks delicious!!! And remember, everyone is welcomed to participate in all the fun at EC Montreal. Peel, core and chop the apples into small chunks. Cut the lemons in half and squeeze the juice over the apple and mix well. This not only adds flavour but prevents the freshly peeled apples from discolouring. Layer the apples, blackberries, and sugar in a large pie dish (a lasagne dish is ideal). Place the flour in a large bowl and then rub in the butter until it resembles breadcrumbs – leave a few lumps of butter so that the topping is not too fine. Add the muesli or oat/seed/nut mixture and the sugar and mix through. Use a spoon to sprinkle the crumble topping evenly over the fruit. Bake for 45 minutes or until the fruit is cooked and bubbling juices seep through the topping. Cool for a few minutes and then serve with custard or fresh cream.